A few years ago, a little-known language called newLISP completely changed my understanding of what “good” programming languages look like. Before saying another word, I’d like to address the question that some of my LISP-familiar readers may be asking right now: Why newLISP? Why not Clojure, Scheme, or Common LISP? The answer is that after evaluating these dialects of LISP, I’ve come to the conclusion that newLISP has several important advantages over other LISPs. The historical context out of which these sentiments are born is mostly unknown to those observing the debate. As signal gives way to noise, the discussion collapses, the melee disperses, and the bystanders go back to sipping their Java and eating their Pythons. It is fortunate, I think, that my introduction to the language did not sprout out of one of these battles. It was, for the most part, largely unbiased. While attending the University of Florida, I had signed up for a course on artificial intelligence. Our professor predictably introduced the class to a programming language called LISP. You get the idea. I did not have a clue as to what it was, but I was excited to finally be forced into the position of having to find out. My grade depended on it, after all. What I discovered was that LISP did in fact live up to its reputation of zealot-inducing awesomeness. Simply being exposed to some of the basic concepts and philosophies of LISP had an immediate and positive impact on my abilities as a programmer. LISP’s relative lack of syntax was perhaps the greatest insight, for I immediately felt as though a great weight had disappeared. I realized that it was syntax that was at the root of most programming errors. It was syntax that created a subconscious burden that I had simply been unaware of; causing errors, bugs, and making it difficult to simply turn my thoughts into code. Despite having many years of experience with C-based languages, and being intimately familiar with their syntax, I realized that it was nevertheless a totally unnecessary burden that was slowing me, and everyone else, down. This is one great advantage of Lisp-like languages: They have very few ways of forming compound expressions, and almost no syntactic structure. . . . After a short time we forget about syntactic details of the language (because there are none) and get on with the real issues. It’s not just the size of the syntax that matters, it’s what you can do with it. What requires layers of special syntax in languages like PHP, Python and Ruby, LISP can do with its basic concepts of lists, functions and symbols. It can do everything those languages can do, in a more elegant fashion, and still have enough tricks left up its sleeve to accomplish feats that are simply not possible in other languages. Despite all of these exciting discoveries I still had an uneasy feeling. Common LISP (CL) was a great departure from what I had known previously, but it reeked of antiquity, and worse, its syntax simply wasn’t very well thought out. The “Zen-like” perfection that it seemed to be yearning for was missing. It was a feeling that Mac users are all too familiar with: There were too many buttons, and most of them were unnecessary. Compared to C++, that’s fantastic. Then again, compared to C++, most languages appear favorable. Having had a taste of the liberty offered by the drop in syntax from C/C++/Java to CL, I did not see why all of this syntax was necessary, and indeed, most of it wasn’t. Every little piece of syntax that’s introduced into a language adds to the programmer’s mental burden, be he conscious of it or not. I was not prepared to spend the effort learning Common LISP if a better alternative could be found. What do you mean by “syntax”? You may object at my inclusion of the functions defvar, =, eq, eql, etc. as they are functions. I include them because they constitute low-level functionality that cannot be expressed in the syntax of LISP itself. In other words, the functions = and eq are low-level primitives that must be defined in the language that LISP itself is implemented in, and their meaning and usage cannot be deduced from any other existing LISP syntax. Consider PHP’s != and !==, they are both operators and are used in the same way, yet that doesn’t tell you anything about what the difference between them is. There’s no way to deduce their meaning from the existing semantics of the language and thus they each represent new syntax that must be learned. Chainshot starts with a grid completely filled with colored cells. Your goal is to clear the board and you do this by clicking on each cell. If the cell has any adjacent cells of the same color, they all disappear. The effect spreads to include all of the cells adjacent to those, and so on. Cells then drop down to fill in the gap left by the vanished group. If an entire column disappears then all cells to the right of it move left to fill it in. There’s a wonderful and free implementation of this for OS X called Otis. For the midterm we were to make a version of this playable by a human, and for the final we had to write an AI to play the game. The problem though was most of the lectures focused on various algorithms and theory for doing AI. Those who wanted the 10% bonus would have to teach themselves the language. Most students chose to forsake the bonus in favor of using a language that they were already familiar with, and like most students I had very little time, so I was partial to that sentiment. However, I decided to do a Google search to see if I could find a Common LISP alternative that was more appetizing. To my delight I found a language that seemed to check all the right boxes, and surprisingly it wasn’t Scheme (although that is a wonderful language as well). Like Scheme, this language had greatly simplified Common LISP’s syntax, but at the same time it came with a standard library full of useful functions for performing modern scripting tasks, and all you needed to run it was a single tiny executable! Here is what ultimately turned me into such a fan of newLISP. We had several months to complete the first part of the project, and the night before it was due, I did not have a single part of it complete. I had spent the night working on other things, and for perhaps an hour I spent some time looking over the newLISP website, reading about it. 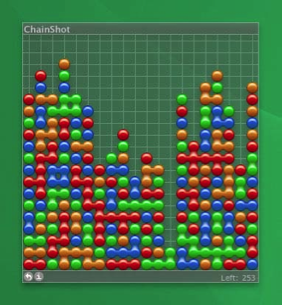 The next day, approximately four hours before I was to hand in my finished, playable version of Chainshot, I sat down at a desk, put on my headphones, and proceeded to simultaneously learn newLISP while creating this game with it. I finished in about 3 hours, of which only about ten minutes was spent debugging. I was dumbfounded. I had discovered something new, a language that allowed me to rapidly write what, after years of C-based languages, seemed like virtually “bug-free code” that just worked. It was a language that I had come close to mastering in a matter of minutes, having never used it before! In the time I had learned newLISP and written a text-based game in it I would probably only be finishing the tutorials for Ruby or Python. At the beginning of this post I made the claim that newLISP has several advantages over the other LISPs. They can all be summarized as follows: If you want a LISP-based scripting language, choose newLISP. newLISP is not a general-purpose programming language. newLISP is a Lisp-like, general-purpose scripting language. Long ago, when computers were slow, the LISP community was mercilessly mocked by their C and Assembly-wielding counterparts for the crime of being too slow. Ever since that time the subject of performance has been a sore spot for the LISP community from which, I dare say, it has yet to fully recover. Its focus turned towards compilation and proving to the world that it too, could be fast. As a result, few seem to have noticed the need for a general-purpose LISP focused instead on interpretation and scripting. Luckily, newLISP seems to fit that role rather well. It is a general-purpose interpreted scripting language. It’s my understanding that because of how dynamic it is, it cannot even be compiled to bytecode (this does not mean it is not fast, though). Without this understanding, some of its design decisions will not make sense. Why choose fexprs over macros? Why dynamic scope instead of lexical scope? Why One-Reference-Only memory management instead of garbage collection? newLISP comes in a single, tiny 200+KB binary executable. Out of all the LISP derivatives I’ve tried, it is the easiest to setup, deploy, and develop for. Somehow that tiny package contains the entire language and includes functions for reading and writing files, parsing text, regular expressions, running code in parallel, over a network, and much more. For the final project I was the only person in the class to submit a fully parallelizable AI (scalable to any number of cores) to solve each grid. The only reason I did it was because I could do it without breaking a sweat. newLISP made it mind-numbingly easy, and this was before it had all the actor and Cilk stuff. Functions do not need any of the &rest, &optional flags. Simply pass in variables or don’t, the parameters that don’t get anything are set to nil, and extra stuff can be accessed through the function (args) or the symbol $args. Functions, like most other things, evaluate to themselves. You don’t need a special #’ syntax to access them. Functions are also real lists. This means you can get their source after they’ve been defined, and even modify them while they are executing. Instead of macros newLISP chose to use fexprs, or functions that simply don’t evaluate their arguments (although to the chagrin of some, newLISP calls them macros). This decision makes sense because in an interpreted LISP, almost everything happens at runtime and there are situations where fexprs can be much faster to execute than macros. It also means that newLISP’s “macros” don’t need the special backquote syntax, making them easier to write and read. You may have heard the mantra against using eval in other languages. In newLISP, this just doesn’t apply. newLISP’s eval is faster than other LISPs. This has many consequences, one of which is that sometimes newLISP’s fexprs can be faster than compiled macros in the other LISPs, but also it means that using eval is no longer frowned upon, which opens up all sorts of coding possibilities. Notice that there’s a single equality operator, the equals sign. newLISP can get away with this luxury because of its memory-management model, called One-Reference-Only (ORO). In short, most things are passed by-value and so you end up not needing all of those ridiculous comparison functions. If two things have the same value they are equal—end of story (except in the case of Objective newLISP). This is not as crazy as it sounds. Internally, newLISP passes data by reference between built-in functions and does other optimizations. You can pass data by reference through the use of contexts and symbols, or by using Objective newLISP. newLISP’s ORO also means repeatable code execution times; you’ll never experience “GC Hell” because there is no garbage collector. Much fuss is often made over newLISP’s use of dynamic scope. It is true, dynamic scope can be dangerous! It’s a small price to pay for the performance improvement, and oftentimes it’s actually quite handy to have dynamic scope (especially in combination with the no-longer taboo eval). If you need lexical scope though, newLISP has you covered. newLISP takes an interesting approach for running code in parallel. Whereas Clojure uses advanced methods for multi-threading and ensuring safety, newLISP simply uses its small size and lets the Operating System do all the work! newLISP’s documentation is one of the best examples of excellent documentation that I’ve ever seen, simply surpassing the documentation for any other LISP that I’m aware of. You don’t need to shell out money for a book to learn it, and that’s because it doesn’t need a book! The short manual included with the reference documentation is all you’ll need to learn the language. Its documentation is one of the primary reasons that I was able to successfully procrastinate for my midterm. If I had to pick a word to describe newLISP’s community it would probably be “cozy” (and for Common LISP it would probably be “abrasive”). Everyone’s question is heard and answered in a friendly and rapid manner, and there is no formality. Lutz Mueller will often answer your question or incorporate your suggestions directly into the language. It’s a small community, yes, but it’s also agile and capable of rapid change without politics. newLISP is a true diamond in the rough, sorely under-hyped, but a thing of beauty nevertheless. Any chance you could share your Chainshot code? That’s fascinating. I haven’t wanted to learn lisp because of time constraints. Sounds like there is no excuse with newLisp. Will definitely look into it. Thanks. Fascinating – a good story, and an impressive achievement in 3 hours. I hope you got your 10% bonus! This is a wonderful write up. I had been going back and forth trying to figure out which (Clojure or newLISP) language to learn this year, and this article answered the majority of my questions in what seemed to be an unbiased fashion. I will say the one spot that made me wince was the “look how productive it made me” that seems to resonate with most write ups about “new-ish” languages. Regardless, I’m looking past that and drinking the kool-aid anyway. Nicely done! What are the “newLISP has several important advantages over other LISPs” that you don’t list? Don’t get me wrong – I love all lisps – but I program in clojure full time. What’s newLISP got as an advantage except no libraries and little community ? a sane implementation of lexically scoped variables will actually generally be faster than dynamic scoping, as they can be computed as static offsets against the environment rather than requiring a lookup table. the perception of lexical scoping as slow is a historical artifact. In addition to the features you mention, you could have mentioned the “NetEval” feature. That is you can sling s-expr’s around to multiple nodes and with virtually no extra code have cluster and parallel processing. In the rare cases that I need to debug something it is possible to telnet to a node performing a specific function and work out what is causing the issue. The one gripe: I haven’t found a really easy way to do GUI programming, e.g. like Tkinter in Python ( of course I hate the Tk/TCL overhead). @Brad, the chainshot code is very old and no longer runs on the current version of newLISP. For the final we did have to create a writeup discussing how our method worked, along with a full listing of the source. If you want that I have it available in PDF form, just shoot shoot an email to the address on the “About Us” page and I’ll send it to you. I don’t want to post it publicly because I believe the professor still uses this project for his classes, and I’m afraid it would encourage cheating. @Tim, I’m not sure how to answer your question as that is sortof what this entire post was about: newLISP is better suited than Clojure is for scripting, but that does not mean that it is better than Clojure in general. Use both for the tasks they excel at. I’ve never been at a loss for some library (especially since newLISP gives you easy access to every C library), and its community is very helpful. @Mark, can you provide something to backup your claim? The fact remains, something is causing newLISP’s eval to beat all the others, and I wouldn’t be surprised if dynamic scope plays a role in that. http://www.paulgraham.com/thist.html goes into a bit of the history as to why dynamic scoping was thought to be more efficient. @Mark, thanks for the link, it’s was a very interesting story but unfortunately the entire thing is about compiler optimizations. The quote from the wiki, you’ll note, is also about compilation. newLISP has no compiler. This was stressed multiple times in the post: newLISP is a Lisp-like, general-purpose interpreted scripting language. The “location of each value” is not known. Until you produce something that discusses how lexical scope is faster in an interpreted language, I think I’ll trust in the benchmarks of newLISP’s eval and Lutz Mueller’s expertise. Everything that I’ve read so far seems to indicate that indeed, dynamic scope is the better choice to use for a Lisp geared towards scripting. an interpreter knows strictly more about the code it’s got than a compiler, though. There’s no reason you couldn’t do the same analysis: if you adopted lexical scope, the interpreter would still know the offset into the environment. mzscheme is a Scheme interpreter, so uses lexical scoping, and at least on this test is 20 times faster on a function-call heavy benchmark, which should test efficiency of variable lookup. There may be semantic reasons to use dynamic scoping, but performance is just a non-starter. One can test lexical vs dynamic scope in CL, because CL allows both. I’ve spent one year using PLT. Excellent IDE, lot of tools, very helpful community. Greg, nice article. 3.5 hours is impressive. What you see in this benchmark is probably the speed difference of continuation style passing in recursive functions in a Scheme, not a speed difference between dynamic and lexical scoping. Thanks buddy for this great post and Your good work on Dragonfly! Thanks so much for writing this, I’m totally going to give newLISP another look. Kudos for being straightforward, well-written and unbiased. Also? Your site design is yummy. problem with wanting to learn new lang is that there are so many, all says “i’m best”. Although i heard of newLISP, never had energy or need to read about it for more than 20 min. but with blogs, it’s like reading tabloids. It’s fun pastime. I saw this title, felt must read it! Then, unawares, it gave me a nice intro to newLISP. about the including of 「defvar」, 「=」, 「eq」, 「eql」 in the syntax, am not sure i agree with the justification. By your justification, it should also include 「;」, 「#| |#」, 「」, 「1+」, 「<」 and i think a lot others. however, i think it's nice the way you had it, because it does give a sense of the comparitive complexity of Common Lisp vs newLISP's syntax. i find it hard to swallow for the justification of dynamic scope though… even suppose due to its faster speed, how many microseconds one might save today? newlisp cannot calc fac(30) ?! A Wonderful post, beautiful actually, proselytisation extraordinare. I’m a lisp newbie but I’ve played around with CL, scheme, racket, closure, emacs etc… Sicp, little schemer and Land of lisp opened my mind. So far, I’ve really liked newLisp. Feels better as a scripting language. The best thing about it is that it starts up almost three times faster than clojure. That made my decision very easy when it came to choosing a language for my command line app. And to top it up, it has a regex library in the standard installation. I had tried without success to use cl-ppcre and asdf in clisp before that. It’s repl leaves much to be desired though- the whole expression has to be in one line!! All in all bye bye cl weenies, its newlisp all the way baby. Domo aregato!! I’m curious if your feelings about newLISP are the same, now that you’ve had a few years to explore and use it more in depth. Has your experience with it continued to be as positive as your initial impression? I still really like it. What has happened over the years is that my understanding of the situations it’s good for has matured. 1. Its ORO memory design, while good in some ways, fundamentally limits its ability to be used for complex programs. My Objective newLISP mitigates that issue somewhat, but no one seems to have used it besides me. 2. Speaking of which, the second issue with newLISP is that its community is still very small, in spite of my evangelism. This means fewer libraries, and more libraries that are out of date. 3. There are other scripting languages that are also very simple that have caught my eye, and yet in many ways are better suited for many tasks. For me, CoffeeScript + NodeJS has taken over web-dev type stuff, where it used to be newLISP + Dragonfly that I would use (I still use that btw for our order backend). Oh, I forgot to mention: since writing this post I also introduced myself to Clojure. Clojure and newLISP are surprisingly orthogonal though, they don’t really seem like competitors to me. Clojure is really nice for writing beefy servers in that nobody else will understand or maintain, so because of that CoffeeScript + NodeJS has actually replaced Clojure for me. Just got a ping in my e-mail from my original comment four years ago — after newlisp I tried many others — including Racket (http://racket-lang.org/), a grown-up version of Scheme that is taking the language in new directions. It used to be knows as PLT Scheme. You might find that useful — everything I’ve heard about Clojure is excellent though, and I really enjoyed watching Rich Hicky’s original presentations about the language theory. I just wish it didn’t require the JVM and I might give it a try sometime. How bout yourself? What are your thoughts on the whole thing? Well, I’ve been a Rebol user for more than a decade, so I’m not easily frightened off by small community 😉 I think Rebol and newLISP share some of the same goals and ethos, so it’s interesting to hear that you ended up in CoffeeScript + NodeJS land, especially after evangelizing newLISP, and appreciating LISP in general. That’s gives me some motivation to dig a little more deeply into those green pastures 🙂 I’d be curious to hear anything about how/why you ended up there. The development experience with it (Node+CS), is rather nice, given all the JS/CS tools out there like Grunt/Bower etc. Lots of great library support, and because of its async nature, fast too. Edit: Also, am currently using it for DNSChain.